Quick Savings » Insurance » life insurance » Vitality review – is it the best health and life insurance? In this independent Vitality review, I review Vitality Life Insurance and Vitality Health insurance and also reveal how to get £50 cashback on Vitality life and health insurance. As one of the most widely quoted financial experts in the national press, and having worked in the insurance industry, I walk you through this review of Vitality in stages. I suggest you read the entire review as it includes key observations and analysis of Vitality's proposition, particularly around how it compares to other insurance products, getting the most from the product and the best way to buy Vitality insurance (and it's not from Vitality directly - which I learnt the hard way). Vitality's marketing department has been in overdrive creating campaigns that include famous faces such as Jessica Ennis-Hill. They have also launched attractive offers such as regular free coffee and cinema tickets, free Amazon Prime or even a free/heavily discounted Apple Watch for people who take out a policy. Later in this Vitality review I explain how the new Apple Watch 4 offer works and look at whether it is worth it. I personally took out a Vitality Life Insurance policy in June 2017, partly to test the product but also because I think it is a decent policy, especially if you heed the advice in this article. It is a product that offers a huge range of discounts and cash rewards if you exercise and live a more healthy lifestyle. The trouble is that the product, while brilliantly innovative can be complicated and Vitality themselves don't do the best job of explaining it to the public. So in this Vitality review, I do just that. I even explain who should consider taking out a Vitality Life insurance policy and who shouldn't and the best way to get a Vitality quote and cashback. In a nutshell, Vitality is a fantastic product but definitely suits some people more than others. You need to get the right advice from a specialist who knows the product as well as the alternative options in the marketplace. I explain who I used in the section - The cheapest and best way to get Vitality health and life insurance including a £50 cashback offer. If you want to jump to specific parts of this review then you can do so by clicking on the links below. How does VitalityLife health and life insurance work? Who should consider Vitality cover? How much does Vitality health and life insurance cover cost? What are Vitality Insurance Payout Rates? Vitality is owned by a South African company called Discovery Holdings. While the name may not be immediately recognisable to UK consumers, Discovery Holdings is a huge global insurance company, boasting over 4 million customers. They pioneered the concept of rewarding customers for living a healthier lifestyle in South Africa. In 2007 they launched the concept in the UK with the help of Prudential by creating PruHealth and PruProtect. Following the success of these UK operations, Discovery Limited bought out Prudential's stake in the joint venture in 2014 and the brands became VitalityHealth and VitalityLife. VitalityHealth is now one of the top 5 providers of Private Medical Insurance (PMI) in the UK while VitalityLife provides their life insurance products. Currently, their adverts seem to be everywhere especially if you live in London. For the rest of this Vitality review, I will use the overarching brand name of Vitality to refer to both VitalityLife and VitalityHealth. What products does Vitality offer? Vitality offers both health and medical insurance but it's important to understand the difference between the two types of policy. Private medical insurance (also known as PMI or just Health insurance) pays for medical care and treatment in a private hospital or as a private patient in an NHS hospital. Pre-existing medical conditions can be covered but often the level of cover is restricted. Normally patients are referred by their GP for immediate treatment, avoiding the lengthy NHS delays. Premiums are usually paid monthly. Life insurance pays out in the event of the death of a person insured under the plan within a specified term. If the lives insured do not die within the agreed term the policy lapses without value. Alternatively, it is possible to take out a whole of life insurance policy which pays out when you die regardless of when that occurs. Premiums for both types of life insurance policy are usually paid monthly. The Vitality Health Insurance plan is a medical insurance policy (as described in the last section) but with some key differences. Vitality Health Insurance is a product that can be tailored to your needs. As you read through this review you will hopefully understand that the Vitality plan is unique and you will get the most out of it if you have it tailored to you and your lifestyle (this is easier than it sounds and I'll explain how towards the end of this article). In addition, you will get the most out of the plan if you engage with the reward system. Having used the Vitality plan for over 18 months, I explain the easiest ways to do this in the section "How does VitalityLife health and life insurance work?" Vitality Health Insurance can be taken out on a fully underwritten basis, a moratorium basis or on a continued personal medical exclusions basis. Full underwriting means that Vitality will assess your personal health before they agree to cover you. A moratorium basis, which may suit someone with less serious pre-existing medical conditions that might otherwise be excluded, allows pre-existing medical conditions to eventually become covered under the Vitality health insurance plan as long as you don't make a claim for the pre-existing condition before an agreed period of time (i.e. two years from the policy start date). The 'continued personal medical exclusions' basis is as the name suggests. Whichever type of underwriting you choose you can set the level of excess on the policy (the amount you have to pay in the event of a claim) between £0 and £1,000. There is also a no claims discount of 65% which you can get from the off, which can gradually increase up to 85%. Your Vitality Health Insurance policy starts with Core cover to which you can add additional benefits of your choice. The Core cover is unusual in that it includes Cancer Cover as standard. Cancer cover covers inpatient and outpatient costs if you are diagnosed with cancer. This is unusual for this type of policy. As standard Vitality Health insurance also covers nursing at home costs and even parental accommodation with certain caveats. You may also have seen Vitality's Full Cover Promise in their marketing campaign which basically means that there is no upper limit to how much they will pay out in consultancy fees in the event of a claim. In a nutshell, the Vitality Health Insurance policy is very comprehensive but also flexible enough to fit your budget or personal circumstances. So far so good! However where the Vitality Health Insurance plan comes into its own is the ability to earn cashback, premium discounts and rewards (including spa breaks, cheap flights, cinema tickets, a free Apple watch or even free Starbucks coffees) by exercising. This ability to earn Vitality points in exchange for rewards is included as standard on Vitality's Health Insurance policies, but not on their Vitality Life Insurance. In the next section, I explain how you can earn these discounts with a Vitality Life insurance plan before explaining how the benefits system works and how you can get the maximum out of the scheme with minimal effort. The Vitality Life Insurance product is much simpler than Vitality's Health Insurance plan. In my view, it is the product that most consumers will want and indeed is the product that I took out back in June 2017. 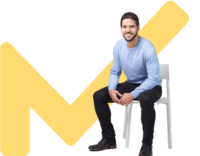 Decreasing Term assurance - this works in the same way as a level term assurance policy except the amount of life insurance decreases over the term of the policy. This makes the monthly premium cheaper and is usually taken out to cover a repayment mortgage. Family Income Benefit plan - works in the same way as a level term assurance plan except the benefit is paid out as smaller regular chunks (like an income) rather than as a single lump sum. Whole of Life plan - where the policy is set up to pay out in the event of a life assured's death whenever that occurs. As you can imagine this is the most expensive option. So far none of this is unique to Vitality, as I said at its core it works the same as other life insurance policies. You can choose to set up a Vitality life insurance policy on a single life basis, joint life first death (i.e pays out and ceases when the first person dies) or joint life second death (it only pays out when both lives assured are dead). Again, all very standard. Where the policy becomes truly revolutionary and life-changing (a strange thing to say about a financial product but I explain why it was for me later) is if you chose to include the Wellness Optimiser programme. One of the criticisms I have of Vitality is the unnecessary use of jargon. Because the premiums on life insurance policies are typically much lower than on health insurance policies, Vitality don't give life insurance policyholders automatic access to the Vitality reward scheme unless they pay a small fee once the monthly premium is of sufficient size. If your monthly Vitality life insurance premium is at least £30 per month you are eligible to sign up to their premium reward scheme which they label as 'Wellness Optimiser' for life insurance customers. A terrible name for a brilliant perk which lets you earn Vitality points by exercising, walking, going to the gym, eating healthily or even going to the dentist. Points can be earned and enjoyed by everyone named on a Vitality policy. The more points you earn (which is far easier than it sounds) the more perks you get, including a discounted or even free Apple watch. You can even get cashback rewards, spa breaks and free Amazon Prime. Vitality also offer a "Lite" version which is available to you if your premium is less than £30. The principle is the same, but there are less benefits available to you. I elaborate fully on how the reward system really works and how to get the best out of it in the next section. But perhaps the most important aspect is that by earning points you can also reduce your policy premiums by as much as 40%. However, even without a potential premium discount as a result of Vitality points Vitality life insurance is still competitively priced against other life insurance products. One other key difference with the Vitality life insurance plan is the ability to add Serious Illness Cover if you wish. The terminology may be unfamiliar to most consumers but Vitality is trying to innovate the Critical Illness insurance market. Ordinary Critical Illness insurance (which is most often bolted onto a life insurance plan) pays out if you are diagnosed with one of a number of named critical illnesses, such as bowel cancer. Critical Illness is often expensive and some industry experts have levelled criticisms over the limited number of conditions these policies actually cover. Vitality Life has introduced Serious Illness Cover which works in a similar way to Critical Illness cover but the level of payout is based upon the severity of the condition diagnosed. This means that the policy can cover a far wider range of 'critical illnesses'. For example, a typical Critical Illness policy will cover around 40 conditions whereas Vitality's Serious Illness Cover will cover up to 178 illnesses! If you opt to add Serious Illness cover to your policy (as I did) you can tailor the level it to suit your budget as it doesn't have to be at the same level as the life insurance cover on your policy. Some Serious Illness Cover is better than none. I personally think it is a nice innovation which again allows greater flexibility for customers. How does VitalityLife health and life insurance work - in particular Vitality points? Now onto the interesting part, how does the Vitality point scheme work? If you take out a Vitality Health Insurance policy you automatically are enrolled in the Vitality reward scheme. 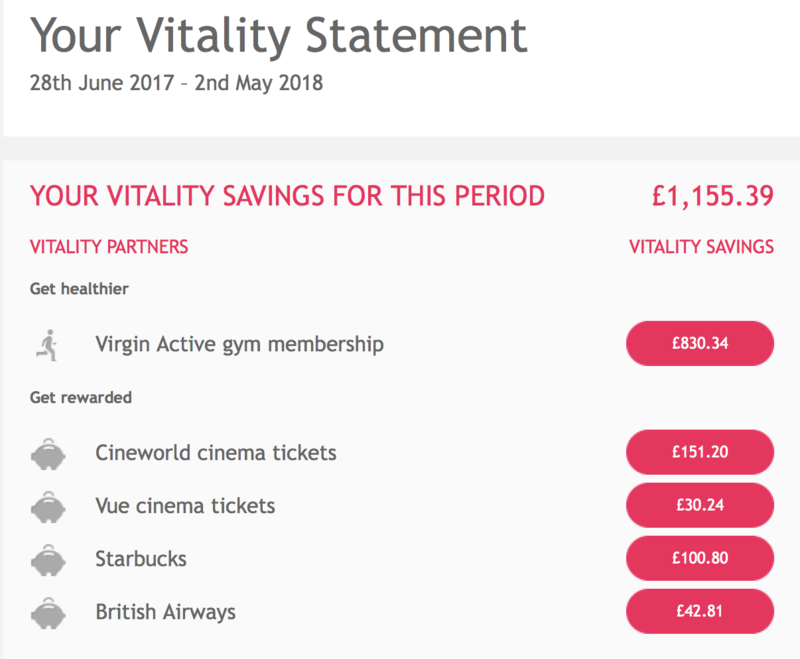 If you take out Vitality Life insurance and your monthly premium is over £30, you can opt to have Wellness Optimiser included on your policy for an additional cost of £4.50 which gives you access to Vitality's premium rewards such as a free Apple Watch, half price Virgin Active Membership and free Starbucks Coffee. As explained above, Vitality also have a "Lite" option which gives you access to a limited number of benefits so long as your premium is over £8 per month and comes at a cost of £1.75. When you take out a plan (be it health insurance or life insurance with Wellness Optimiser) you are given a Vitality status. You start on bronze and can progress to silver, gold and ultimately platinum. The more effort you make to be healthy the more Vitality points you earn and you can increase your status to Silver, Gold or even Platinum. The higher your Vitality status the better and greater the rewards you receive. Every member has a login area called the Vitality member zone. The screenshot below (click to enlarge) shows my member area. If you collect enough Vitality points over a two week period you receive free cinema tickets (which can be used at Cineworld and Vue cinemas). Not only that, so long as you hit your reward goals, you can also earn regular sized Starbucks coffee each week. Now if you have a joint policy, as I do with my wife, the points you both earn individually are combined when determining your overall Vitality status. The level of points for each status level (i.e. silver or gold is higher but not double that of a policy taken out by one person). For the weekly perks like the Starbucks coffee, you achieve these on your own. So my wife earns weekly points for her own coffees, as do I. However, if you take out a life insurance policy with Wellness Optimiser I suggest you add your children to the policy. Adding a small amount of Serious Illness Cover to your policy for your children only costs a few pounds each month. However, whenever my wife and I each earn 12 Vitality points a week we both get a free Starbucks Coffee and so long as we do this two weeks in a row, the whole family gets a free cinema ticket too (including the children, up to a maximum of 36 tickets per year). To earn 12 points you just have to carry on your normal daily life while wearing either an Apple watch or Fitbit that counts the number of steps you make. It's that easy. If you don't have either of those devices you can just use your iPhone's inbuilt 'activities app' which tracks your steps anyway. Now I don't collect my free coffee every week or even go to the cinema with the family very often despite the free tickets. However, the statement below shows I have saved a total of £1,155.39 through the Vitality awards scheme from June 2017 to May 2018 and I have recently received a further statement confirming that in just six months (June 2018 to December 2018) I have saved a total of £925.10. This doesn't take into account the fact that my wife and I also received £125 each in cashback (so a total of £250!) at our policy anniversary or the Champney Spa break and discounted Eurostar tickets we've booked. In February 2019 Vitality made a change to their cashback terms and no longer offer an annual cashback payment. They now pay up to £400 per policy, paid every 3 years. The important thing to understand that as long as you live a moderately active life (by that I mean that you do leave the house from time to time) you can achieve plenty of Vitality points to enjoy all of the benefits described so far. The Vitality reward system is fantastic and this is coming from a guy who hadn't been to a gym for a decade. I didn't do any exercise at all. However, you'd be surprised how many steps you do in a day. If you are able to do 12,500 steps (which is easy if you are chasing around after a toddler or commuting on public transport into London) you will get the maximum number of activity points you can for that day (which is now 8, it was previously 10). However, if you visit the gym you get 5 points for going and even more for the steps and activity you undertake. You can see how it's pretty easy to hit the 40 point max level (per person) each week. If you answer a few online questionnaires or have a quick health check you can get over 1,000 Vitality points straight away which means that you will leap to Silver status almost immediately. 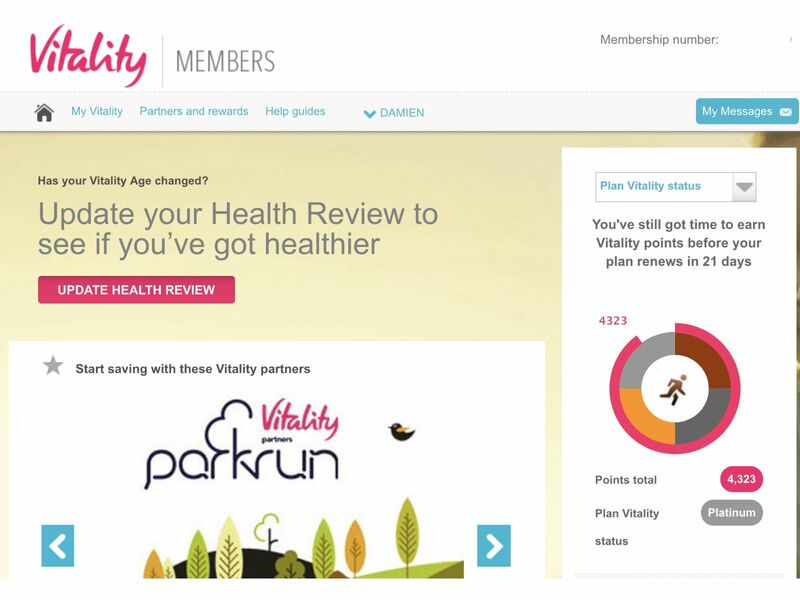 The Vitality product is built upon clever psychology which has been shown that if you incentivise (i.e give rewards and cashback) and penalise (i.e premiums go up if you don't exercise) in tandem you are more likely to change human behaviour. This is the reason why I now go to the gym at least twice a week (a guy who never went) and enjoy it. I will walk to the shops occasionally rather than drive and am a bit more health conscious. I am 40 and never felt so good. Truly life-changing. As an aside Vitality are looking to extend this carrot and stick approach with other financial products and have just introduced pension and investment discounts to the Vitality scheme but that's not relevant here. By making me more healthy I'm less likely to make a claim on the policy which is why Vitality rewards me. One of the big marketing draws for potential Vitality customers is the ability to get an Apple Watch for free. It means it is the cheapest way to get a new Apple 4 watch when you combine it with the £50 cashback offer mentioned in the last section of this review. By way of example if you want the Apple Watch Series 4 you make an initial payment £99 or £129 (depending on whether you opt for the 40mm or 44mm size) when you take out your Vitality policy (your £50 cashback will reduce this to just £49!) followed by 24 monthly payments of between £0 and £10.00. The amount you are charged each month varies and depends on the number of Vitality points you've earned that month. Earn less than 40 Vitality points in a month and you have to pay £10.00. The image below shows how many points you need to earn a month to reduce the amount you pay for the Apple Watch Series 4 down to zero. Given that 40 points is the maximum number you can earn for activities in a given week unless you were fully engaged with maximising the number of points you earn every day you will end up paying something for the watch each month. I personally had an Apple Watch before I even took out the plan so the offer didn't matter to me. The Apple offer is pretty good but only the most dedicated will get it for £49 in total (including the £50 cashback offer described at the foot of this review). If you want an Apple Watch Series 3 you can get it for an upfront cost of just £9. If you use the £50 cashback offer it means you can get an Apple Watch 3 for Free, with £41 cashback, which is pretty good. Vitality life insurance and health insurance are great for those people who are already considering taking out such products but who also lead busy lives. So if you commute and walk to the office or to the station you will accumulate points quickly. If you have a young family you will not only earn points just rushing around after them but you can all enjoy the rewards which amplifies the savings. I, for example, could get 40% off British Airways flights for my whole family of four. If you live in London in particular all of the rewards are easily accessible. There are thousands of Starbucks and you are never too far away from an eligible gym, cinema or spa. If you do like running or going to the gym you will ratchet up the Vitality points even quicker ensuring that you receive the maximum cashback award of £400 per policy, every 3 years. For me, as my wife was already going to the gym, by taking out the life insurance policy we both got 40% off gym membership (she was previously paying full price). The policy pays for itself via the discounts and rewards, and as you can see from my reward statement above I'm actually better off having taken the policy out, plus I now have sufficient life insurance to look after my family. If you go online and read forum posts or customer comments about Vitality the few negative comments seem to be disgruntled comments about Vitality not paying out on claims. Yet this is completely inconsistent with the independently audited industry statistics which show that Vitality Life paid out on 99% of claims in 2017, 2016 and 2015, which is above any other leading life insurance company in the UK. So the reality is that if you are going to pick an insurance company based on their claims rate then you'd chose Vitality, clearly. However, in the section titled 'The best way to get Vitality Life Insurance' I explain how you can reduce the chances of you being in the 1% even further if you do need to make a claim. Here is a sample of some of the Vitality life insurance and Vitality personal health insurance customer reviews you can find online. You will notice in particular the last two comments focus on the frustrations of dealing with Vitality directly, especially when setting up the policy. When I originally tried to take out the policy I contacted Vitality directly but grew so infuriated with their staff that I almost gave up. Fortunately, I found another way that made it so slick and easy that taking out the policy was straightforward, and I'm glad I did. I explain how you should and can do the same in the section 'The best way to get Vitality health and life insurance?'. "Do it. An enjoyable experience." "Excellent benefits, Sadly the range of Gyms does not cover my area"
"Waited 30 mins before hanging up! Impossible to get to customer services, rewards are easy to obtain but if anything goes wrong on your insurance don’t expect it to be solved instantly as they must be sitting in their office having a party or something?" "It's a nightmare trying to get them to get back to you on anything." Vitality life insurance, in particular, is a fantastic product which is incredibly cost-effective and can even save you more than it costs (as it does me) if you are moderately active. However, Vitality's biggest hurdle is helping consumers to fully understand the product. Vitality acquires a lot of its customers via tie-ups with employers or sports clubs whereby those who are covered on the company plan are already engaged in healthy activities. However, trying to explain the product to consumers directly in a succinct and easily understandable way requires a level of knowledge and expertise. Unfortunately, their own advisers, who you speak to if you call them directly, can make what should be a seamless journey harder than it should be. By way of example when I first looked to take out a Vitality insurance product I called them directly, only to become frustrated by their adviser's inability to give me what I needed. I simply wanted the minimum amount of life insurance to ensure that I could benefit from the Vitality reward scheme (with discounted gym memberships etc). As I said earlier, I worked in the industry and know how underwriting works. My frustrations led me to complain. However, via an industry contact, I was put in touch with an independent life and health insurance specialist, who is also an expert in Vitality Life and Vitality Health insurance products. Not only was he able to quickly tailor the product to what I needed but also get the maximum level of cover for my budget, due to the preferential rates his firm enjoys, plus give me £50 cashback. But more importantly, if you contact Vitality directly they will only sell and advise on their own products. That means that if there are more suitable products in the market (that are not Vitality) then they won't advise you on them (plus you won't get cashback). However, the insurance specialist who I used (his name is Gurt by the way and can be contacted via this form) will tell you whether Vitality will work for you without any form of pressure selling. He can also offer advice on the whole insurance market if Vitality doesn’t suit your circumstances and you will still get £50 cashback. I am a cynic and so wouldn't recommend him unless the service had been exemplary. Just put your contact details in the form and chose the time of day to have a quick chat. A good independent insurance broker should not only advise you, but explain how the scheme works, how you personally could get the most out of it and ultimately process your application. Any life insurance application can take time so you have to be patient but the hassle is taken out of it. Ultimately I like the Vitality product and have recommended it to family and friends but only when using an independent specialist broker (such as Gurt in my case). It is a product that should be revolutionising the industry and changing lives. It's not managed to go mass market yet but Vitality seems committed to ensuring it does. I for one hope they succeed.